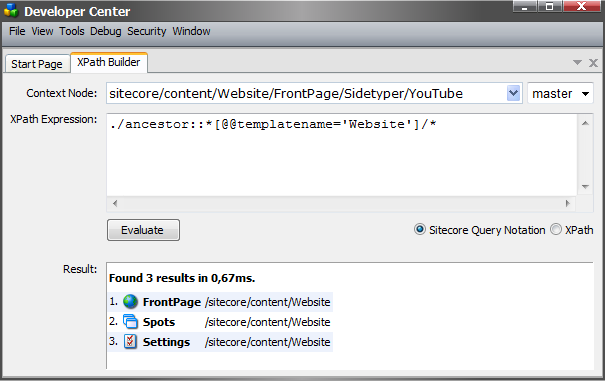 There’s also an XPath Builder plugin for Sitecore Rocks. I’ve also found the XPath Builder to be a good tool for gathering quick and dirty reports/statistics. For instance, generating a list of items that have been updated after a specific date or how many items use a specific template. Another little tidbit: you can also use “fast:” query syntax in the XPath builder. Hadn’t thought of that Adam W. Good idea! I’ve been using it for quite some time and it’s a great little tool for quickly querying your data and get some statistics/reports. It’s also a good tool to use to test your queries for efficiency. Like Adam W. mentions you could use it to quickly see the gains in using a fast: query as apposed to a normal query. * Ability to extract reports. Somehow allow you to save the results to file. * Ability to save searches to be run later. FYI: The XPath Builder is also available in Sitecore Rocks as a plugin. It provides pretty much the same functionality, but I think Christian has some very good ideas!